The Crown of João VI & the Sceptre of the Armillary; Ajuda National Palace. The Crown of João VI, also known as the Portuguese Royal Crown (Portuguese: Coroa de João VI; Coroa Real de Portugal) is the most recent and only extant crown of the Portuguese Crown Jewels. 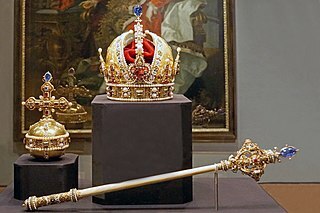 The crown is fashioned out of gold, silver, iron, and red velvet. Its eight half arches are surmounted by a monde: a globus cruciger on a crown, with a cross at its top—as Portugal was a Catholic nation. The base of the crown is elaborately decorated with baroque patterns and designs. The Crown of João VI was made in 1817 for the acclamation of King João VI. The crown was fashioned in the workshop of D. Antonio Gomes da Silva, the Royal Jeweler. The crown was made as part of the set of crown jewels, which included the Sceptre of the Armillary and the Mantle of João VI, which was specifically made for João VI's acclamation. It then became the official crown of the monarchs of Portugal and was used by all the Portuguese monarchs after João VI. Though serving as the monarchy's official symbol, the crown was never actually worn by any Portuguese monarch. In 1646, King John IV of Portugal had consecrated the Crown of Portugal to the Virgin Mary; following this, no Portuguese sovereign ever wore a diadem, though it was usually present at the ceremony where his ascension was proclaimed. The crown saw its last official use during the reign of Manuel II of Portugal, when it was used for his acclamation and at the official opening of the Cortes, the Portuguese parliament. The Crown of João VI, along with all the other Portuguese Crown Jewels, are kept in the Ajuda National Palace, in Lisbon, though they are not on display to the public. 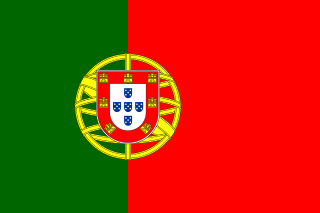 The flag of Portugal is a rectangular bicolour with a field unevenly divided into green on the hoist, and red on the fly. The lesser version of the national coat of arms is centered over the colour boundary at equal distance from the upper and lower edges. On 30 June 1911, less than a year after the downfall of the constitutional monarchy, this design was officially adopted for the new national flag of the First Portuguese Republic, after selection by a special commission whose members included Columbano Bordalo Pinheiro, João Chagas and Abel Botelho. 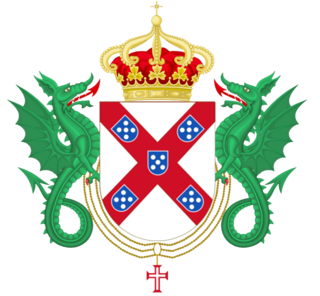 The Most Serene House of Braganza, or the Brigantine Dynasty, also known in the Empire of Brazil as the Most August House of Braganza, is a dynasty of emperors, kings, princes, and dukes of Portuguese origin, a cadet branch of the House of Aviz. The Portuguese Restoration War was the name given by nineteenth-century Romantic historians to the war between Portugal and Spain that began with the Portuguese revolution of 1640 and ended with the Treaty of Lisbon in 1668. The period from 1640 to 1668 was marked by periodic skirmishes between Portugal and Spain, as well as short episodes of more serious warfare, much of it occasioned by Spanish and Portuguese entanglements with non-Iberian powers. Spain was involved in the Thirty Years' War until 1648 and the Franco–Spanish War until 1659, while Portugal was involved in the Dutch–Portuguese War until 1663. The transfer of the Portuguese Court to Brazil occurred with the strategic retreat of Queen Maria I of Portugal, Prince Regent John, also referred to as Dom João or Dom João VI, and the Braganza royal family and its court of nearly 15,000 people from Lisbon on November 29, 1807. The Braganza royal family departed for the Portuguese colony of Brazil just days before Napoleonic forces invaded Lisbon on December 1. The Portuguese crown remained in Brazil from 1808 until the Liberal Revolution of 1820 led to the return of John VI of Portugal on April 26, 1821. For thirteen years, Rio de Janeiro, Brazil, functioned as the capital of the Kingdom of Portugal in what some historians call a "metropolitan reversal", i.e., a colony exercising governance over the entirety of the empire. The period in which the court was located in Rio brought significant changes to the city and its residents, and can be interpreted through several perspectives. It had profound impacts on Brazilian society, economics, infrastructure, and politics. The transfer of the king and the royal court "represented the first step toward Brazilian independence, since the king immediately opened the ports of Brazil to foreign shipping and turned the colonial capital into the seat of government." The Mantle of João VI, also known as the Mantle of the United Kingdom of Portugal, Brazil, and the Algarves, is the royal robe, a part of the Portuguese Crown Jewels, that was fashioned for the acclamation of King João VI, alongside the Crown of João VI and the Sceptre of the Armillary. The Sceptre of the Dragon, also known as the Sceptre of the Crown and Constitution, is a piece of the Portuguese Crown Jewels, originally created for the acclamation of Queen Maria II. The Mantle of Luís I, also known as the Mantle of the Constitutional Kings, is the royal robe, a part of the Portuguese Crown Jewels, that was fashioned for the acclamation of King Luís I, though used by all Portuguese monarchs after him.